When Magicka was released, it was much loved for its interesting combat, which allowed players to create spells using a mixture of eight elements, and the humour coursing through it. However, it was notoriously buggy, with the main problem being the online play, a feature many players griped about. Still, it managed to sell over two million copies, so when the recently-founded studio Paradox North, a development company created to focus on making action and online titles for the usually strategy-oriented Paradox Interactive, was set up it was the perfect game to build on. Enter Magicka: Wizard Wars, a new action PvP game that aims to right the wrongs of the original game while bringing a new form of gameplay. It still looks and handles like the original Magicka, with the elemental spell casting very much intact, as well as the charm and humour, but plays a little more like a MOBA. Two teams of four spawn onto a map, tasked with capturing spawn points and preventing them from being taken by the other team. Each team has only a limited number of respawns, so if one team holds two of the three spawn points on the map, their opponents’ number of respawns begins to drop, meaning that it’s not just a case of killing off your opponents, but also making sure they can’t keep coming back. And if one team holds all three spawn points and eliminates the other team, then it’s game over. 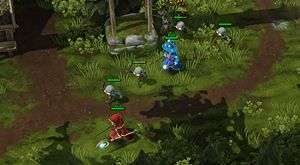 If this is all sounding a tad League of Legends crossed with Battlefield, don’t worry; Wizard Wars has plenty of its own tricks up its sleeves. You customise your character’s loadout before each match, with each item having certain advantages and disadvantages – for example, I chose to equip a robe and staff that increased the power of my healing spells and earth-based elements, but in turn reduced the effectiveness of barrier spells and made me more vulnerable to fire. These stats aren’t private either as, during the loading screen, your opponents’ biggest strengths and weaknesses are displayed above their head, giving you a few brief moments to work out how best to take them down when you do cross paths. And once you’ve chosen that loadout, you’re stuck with it for that match, and you can’t buy additional items to boost your skills in any way. Combat has been given an overhaul too. First up, you can now move and cast spells at the same time, allowing you to chase after enemies while dealing damage, and giving the game a much faster pace than the original. The spells are also now context-sensitive, so that you can click on your character and have the effect of the spell directly affect you, although you can still use the middle mouse button to cast spells on yourself if you prefer. Melée attacks are also revamped for this game; instead of just pushing people away with a spurt of air if you don’t have a spell lined up, your character will swing a melée weapon and dish out some punishment. The spell casting has been made much simpler, with each spell combo capped at three elements, something I personally welcome with open arms. One of my problems with the first game was the casting of Magicks, specific elemental combos that, when keyed in and cast, would generate a pre-designed spell. This time, Magicks have been limited to four, assigned to hotkeys, and can’t be cast willy-nilly – instead, a bar fills up over time, and unlocks the Magicks in order of effectiveness. For example, my first Magick, a spell that gives your character a huge speed boost for a short time, used only one section of the bar, as it was only particularly useful in a pinch. Next to be made available was a revive spell, followed by the option to summon Death to help reap the souls of your enemies, and finally there was an Ultra Magick that cost the entire bar – in my case, a meteor storm that completely destroyed everything in the area in which it was cast (myself included). The bar recharges continually throughout the game, but the balance does work quite well. A player using the speed boost can outrun Death, and the Ultra move can be avoided if you escape the target area, so waiting to use these powerful spells may not be the best tactic, but can certainly change the tide of a battle. But possibly my favourite part of Magicka: Wizard Wars is the team behind it. Paradox North are following three development goals – they want to make the game with the community, fix the network problems of the first game, and create a new, improved, and working version of the game every two weeks. There’s also a very ad-hoc dynamic to the team, with everyone being given free rein to inject humour into the game where they see fit, seen in the item descriptions and the general feel of the world, with my personal favourite addition of what was described as Animals 2.0 (cardboard cut-outs of animals that explode into piles of meat when destroyed). The whole design ideal seems to be based around making sure everyone is happy, by working with the community to find out what they want in the game, and allowing the dev team to constantly create new and exciting things for their audience to play with, which I think is a wonderful way to make games. With an interesting take on a genre that’s exploding in popularity, mixed with the dynamic spell casting and humour of the original, Magicka: Wizard Wars is definitely one to keep an eye on. Interested parties can sign up for the closed alpha, with rewards unlocked for everyone if a certain number of people sign-up, but it looks set to be in continual development for some time yet.